A garden cart comes in handy when you need to transport items from one section of your yard to another. With a cart, you can easily haul a bunch of things including firewood, mulch, debris from your yard, and so much more. 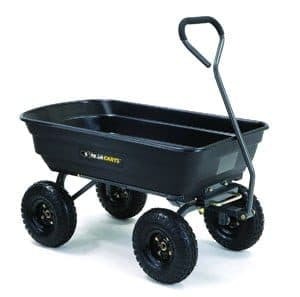 Just be sure to buy the right kind of cart, which you can find from our top 10 best garden carts in 2019 reviews. We have gathered for you the finest selections of products in this category that will surely meet your needs and requirements. When buying a yard cart, you want to make sure the material is sturdy. Choose one that comes with a weather-resistant feature, which is perfect for ensuring the long lifespan of the cart. A comfortable grip for the handle is another great feature as this allows you to push and pull the cart with ease. Look for wheels that can maneuver easily, as well as a spacious tray to carry around multiple things that need to be transported. If you’re ready to start shopping for a garden cart, then let’s begin! 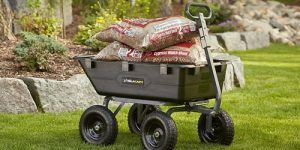 Here are our top 10 best garden carts in 2019 reviews that can help you select the perfect item you need. Forget that cheaply-made wheelbarrow. This garden cart is a much better choice because it’s got dual wheels that lets you maneuver with ease, along with a nice loop handle for convenience in lifting the cart and balancing it. There is a roomy tray that measures 5 cubic feet, which is just right for hauling your yard debris, mulch, and so much more. It is even much lighter than the average wheelbarrow, so this allows you to transport a lot of things with minimal effort. But then, there is one thing that we think could use an improvement in this item. The washers are not as sturdy as how we expect them to be. They are a little thin, which means you will have to replace them with better quality ones in case they break eventually. The name speaks for itself – this cart is definitely as strong as a gorilla! It can handle as much as 1,200 pounds of weight, which means you can haul as much as you need to in just one go with this cart. It comes with a handle with a dual purpose, basically allowing you to have the cart towed right behind your ATV or by hand. The tires are super thick and great for any type of terrain. As a nice bonus, this cart is backed by a 1-year warranty (limited). This cart is near perfect because of how sturdy and well-made it is. However, it is a little bit inefficient to use because the mechanism requires you to pull its latch lever just to lock back this component in place. It would have been better with a spring tension, but other than this tiny flaw, we think this garden cart is great. 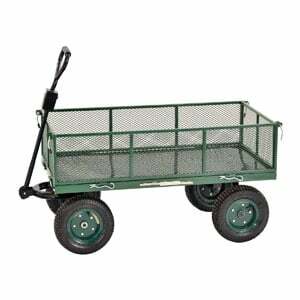 A wonderful steel-made garden cart, this crate wagon from Sandusky Lee can accommodate up to 800 pounds of load. The sides are removable, which makes the wagon perfect as a flatbed. There is a steel mesh for greater resistance to rust, as well as a powder coating for optimum durability. This is an outstanding item for organizing, transporting, and storing supplies, equipment, and various items in the yard, in industrial settings, and so much more. Perhaps one drawback of this cart is the difficulty with the assembly. It’s not very easy to put together, aside from the fact that it smells a little. According to some customers, it took them about 30 to 45 minutes to set this whole thing up completely. With 6.5 cubic feet of space for the tray, you can fit in so many things inside this cart. The edging is made from galvanized steel, and there are 20-inch pneumatic wheels that can handle any terrain without a problem. The handles are super strong as these are steel-made with a silver finish. The wooden bed is perfect, and it should be able to handle tough external elements. Lastly, the fasteners are stainless steel, which means they are quite sturdy and should not tear or loosen easily. It is just the assembly process that is a bit of a pain with this cart. The directions are a little hard to understand, so you can expect to take 45 minutes to maybe an hour in putting everything together. But once it is all set up, you will be impressed with the overall quality of this amazing garden cart for your yard. You can lug around as many things as you need in this very spacious and sturdy garden cart from Suncast. It has a 15.5-gallon load capacity, which should be perfect for transporting mulch and several other items. The cart is easy to use and it is lightweight enough to pull and push around. There is a telescoping handle for your convenience, and the 7-inch wheels add to your ease in maneuvering the cart to reach point A to point B. Our only gripe about this product is the tendency to tip backward. This happens when the other side is empty and the cart is positioned on a slightly slanted area. We wish there was something to prevent this issue, and perhaps what you can do is to simply make sure you set it up in a flat and leveled area to prevent it from tipping. 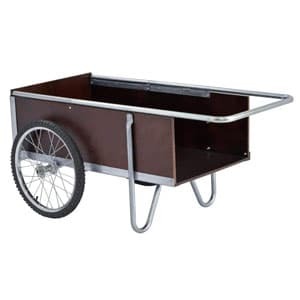 Storage is a breeze with this amazing wagon for your yard or other purposes. 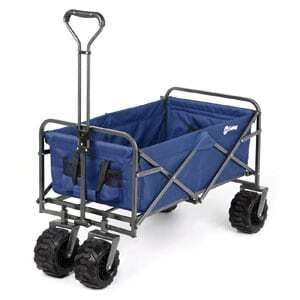 It is a multi-purpose wagon with a large capacity, so you can conveniently transport items anywhere you want. Since this is a collapsible cart, you can easily take it to the park, beach, or even when you go camping. The load capacity is 265 pounds, and there is a durable fabric included made from 600D dual-layered Oxford for optimum sturdiness. Installation is a breeze and the wheels are all-terrain for a smooth rolling action. For the most part, this cart works quite well even on rough surfaces. But then, we think the front wheels are too narrow. This tends to cause some issues with the smooth movement, although it is nothing major to worry about. Eye-catching and highly functional, this garden cart from Gorilla Carts is one of the best you can find in stores. The sides can be removed to let you transport the cart anywhere you want to go. There is a padded handle for a comfortable grip and the bed is made with steel mesh for maximum durability. You can haul as much as an 800-pound worth of items in this cart without any problem. 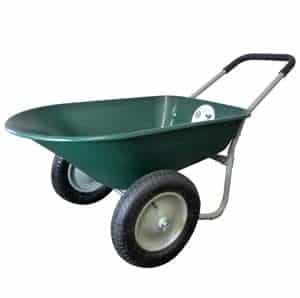 This makes any tough job much easier than using a standard and rickety wheelbarrow that barely gets the task done with ease. 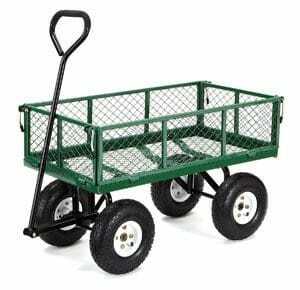 There is no doubt this is one of the finest garden wagons on the market today. It can handle a huge load, but then you will have to distribute equally the weight to prevent the cart from tipping backward. It would also be better if the front and back can be taken apart while having the sides still attached. Not a big deal, though. 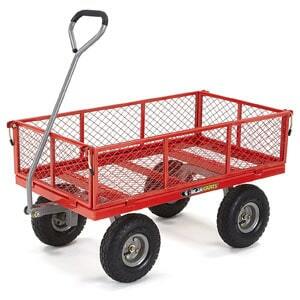 Do you need a little cart for hauling small items in the yard? If so, this product is just what can get the job done. 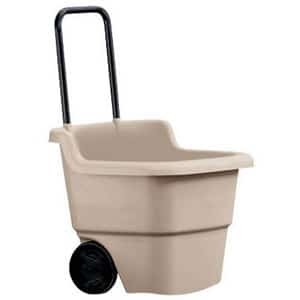 It is made from plastic, yet this cart is very durable and lightweight at the same time. 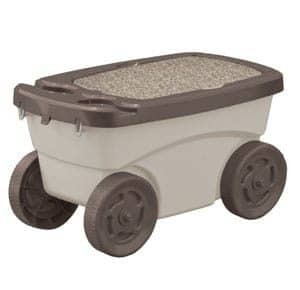 Inside is a small bin for placing miscellaneous items, and you can use this to haul your gardening equipment and supplies. There are even two drink holders included and a foam cushion that you can use for sitting comfortably. We like this garden cart a lot as it suits our needs well. But then we think that the base of the wheel is a tad narrow, and this may cause the cart to tip over when there are curves. It is also a little bit irritating to deal with the little basket that seems to have a hard time to stay right in place all the time. 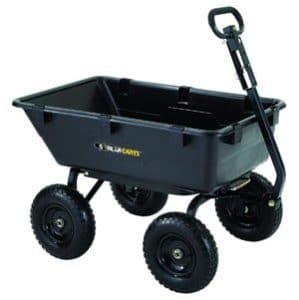 Highly durable and easy to maneuver, this is a well-made garden cart that comes with 10-inch all-terrain pneumatic tires. The design for the frame is impressive, as it offers a quick and hassle-free assembly while ensuring optimum rigidity and maneuverability of the cart. There is a removable side mesh for versatility, which comes in handy when you are transporting heavier and larger loads. If there’s one thing that we don’t like much about this item, it would be the foul smell it has. Upon opening the package, you can quickly smell the foul odor it has, which means you will need to air it out first for a day. The tires are also underinflated, so you will have to inflate it accordingly before use. We are so pleased with this amazing garden cart that simply makes unloading and transporting heavy loads a breeze. No matter what terrain, this cart can definitely handle it all because of its great quality pneumatic tires. It can hold and carry as much as 600 pounds of weight, and there is a redesigned frame with maximum durability and ease in putting together. With a quick-release patented dumping feature, you can effortlessly dump heavy loads in a snap. This is an excellent multi-purpose cart that is perfect for the price. You will love the dump and tilt feature, which makes it a breeze to unload things. One word of advice about this product, though. You will need to spray some WD-40 to the bolts and screws to make sure they screw together with ease during assembly. There you have our top 10 best garden carts in 2019 reviews. We are very glad to have presented to you our recommended items in this category. By now, you have probably made a decision on the item to buy, which you can use in your yard or elsewhere – anytime and anywhere you need to transport heavy items with ease and convenience.